Planet Dog is one of my favorite green companies. My dogs love Planet Dog toys, and I love that they’re made in the USA from recyclable (and often recycled) materials! Plus, they give 2% of every sale to the Planet Dog Foundation to support service dog organizations. I was thrilled when Planet Dog asked me to test out their new Wood Chuck ball thrower. It’s made from reused cork scraps and sustainable bamboo. 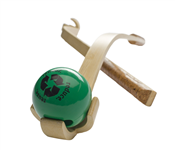 It has a classy, elegant look that’s way more attractive than the brightly colored plastic ball chucker we have, and a the cork handle looks way more comfortable! But, we already have a ball chucker and while I’d much rather have a Wood Chuck, I’m a firm believer that using what you have until it wears out is one of the best ways to go green. I love it! The dogs love it! They love it so much that they chewed the balls immediately. I think the Wood Chuck is wonderful and sturdy, and the ball that came with it is great too, just didn’t hold up in a group setting, the balls would probably be fine for a smaller dog that doesn’t like to destroy their toys, but these guys are rough players, so they chewed it pretty quickly. The Wood Chuck will work with any 2.5″ ball, and Planet Dog has several to choose from, so if your dogs are rough players too, you might want to try another ball style. Argo and Stella have several Orbee-Tuff balls, and while they will destroy many a toy in seconds, Planet Dog balls have always been spared from the path of their destruction. Our favorite here is the Orbee-Tuff Glow for Good ball. I have my eye on a Wood Chuck when Argo and Stella’s ugly plastic ball chucker finally bites the dust. But what if you don’t have a dog? Well, then, you should head to your local rescue organization! If you live in Rochester, NY, consider adopting one of the awesome dogs at Wooftown Rescue, like Raymond! 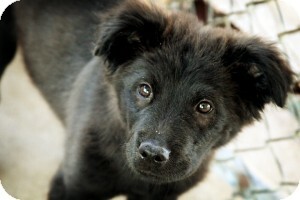 Raymond is a 4 month old Border Collie/Chow mix who would love to play ball with you! Check out his listing as well as listings for other Wooftown Adoptable Dogs here. A huge thanks to Ashley & Wooftown Doggie Daycare and Rescue! While Planet Dog provided Ashley with a Wood Chucker and I’ve been given Planet Dog toys to review in the past, our opinion are our own.